When treating head lice you need to decide whether you will use a homemade or a commercial treatment. Find out the pros and cons here of each. I've already told the beginning of my family's head lice experience in the introduction to this head lice treatment series, but for those of you just tuning in basically as soon as we thought my daughter had lice we rushed out, late at night, to an all night pharmacy and bought commercially available head lice shampoos, sprays and anything else we could get our hands on. We were desperate, and we panicked without learning the facts or thinking our actions through. It seemed like we should act quickly and decisively. Learn from my family's mistakes. Sit back, read the whole series before you act, and you will get a much better result with knowledge than with gut reactions, plus you might just save yourself some significant amounts of money too. Let's be clear, before I begin this discussion of the pros and cons of commercial and homemade lice treatments, that I am not completely partial in this debate. As a spoiler, right now know that we tried the commercial products and they didn't work, while the homemade remedy we tried did. These results speak volumes to me, and I hope to you too. This is especially the case for me, a person who trusts medical science in general, since it was kids' pediatrician's office who advised the home remedies. When I explained over the phone that I had tried a commercial treatment the sound of the nurse's voice made me imagine her sitting there, shaking her head and thinking, "these crazy parents, when will they learn not to panic and call us first, so we can tell them what really works?" 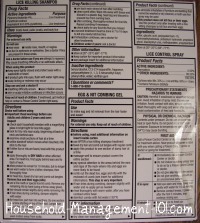 Let's also be clear about what I am talking about, with regard to commercial head lice treatments. There are lots of products on the market today that are designed to deal with head lice in some form or fashion. I do not intend to paint all of them with the same bad brush stroke, because I have not tried or done research about every commercially available product that is on the market. For instance, you can buy lice combs when treating head lice. That is a commercially available product, but it is not what I am talking about here, because it is a product designed to manually remove nits and lice from hair, which I recommend doing, and I also recommended using a lice comb to do it. Further, there are "natural" products on the market today that claim to deal with head lice in ways that contain no insecticides. Again, I have not tried these treatments, and I am not really discussing or endorsing them in this article. What I am discussing when I talk about treating head lice with commercially available products is those which contain insecticides and other man-made chemicals which are designed to kill the lice with poison. Basically, these products contain lots of warnings on them, as you would expect with anything poisonous that you put on your child's head, and are being sold as a quick fix to your lice problems. Knowing these things, here are my thoughts on the pros and cons of treating head lice with commercial insecticide treatments versus homemade treatments. 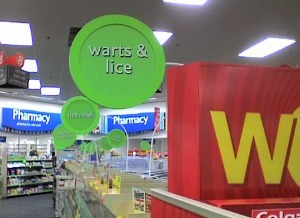 As you can see from the picture at the top of the page the spread of lice is now so epidemic it has its own place in the aisles of any pharmacy, right along, in this case, with warts. 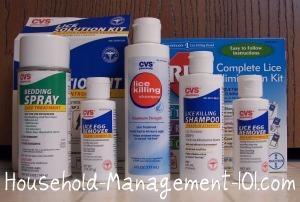 Many people (including me) instinctually buy these products whenever their child gets lice, and then hope for the best. They assume, as I did, that they work. * I cannot speak for everyone when I say they didn't work. My impression with speaking to the nurse at my pediatrician's office is that the shampoos and commercial products not working is not a uncommon phenomenon. Yet, I can only speak for my own experience. Perhaps we used the product wrong, not following the directions properly, and that is why it didn't work to kill lice in my child's hair. That is possible, since we were a bit panicky at the time. However, if two adults, both with graduate school educations, cannot apply a product to their child's hair properly, when attempting diligently to follow the directions to the letter, I am not sure anyone else can either. I must confess I am not one to use homemade remedies where health issues are concerned. I love homemade cleaners, for example, but that is because I understand the science behind them. For my children's health give me some good old fashioned medical advice from a person with a lab coat any day. However, when it is the medical professional suggesting to use the homemeade remedies I listen carefully, and I follow their directions. After all, that is why I pay them, to tell me what actually works. I was told to use a home remedy head lice treatment by my children's doctor, and the end result was that it worked for us. Did it work perfectly, with no problems, no. Would I use it again? Absolutely, I would use a home remedy (but perhaps not the same one) for the following reasons. Not every one of the remedies out there works. This series is to help you understand what works, and what doesn't, for home remedies just as much as with anything else. Some remedies suggested are just plain dangerous -- for example do not, I repeat do not, put kerosene on your head. Kerosene is highly flammable. You don't want to risk severe burns or death to kill some bugs. These home remedies for head lice are not a quick fix. 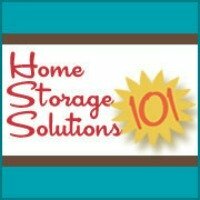 Besides treating head lice with these measures there are sooooo many other additional steps involved in ridding your home of lice, and keeping it that way. Unfortunately, I could not find a quicker fix. So, my suggestion for treating head lice is to use a proven home remedy, and skip the insecticide laden commercial products. The next parts of the series will discuss these remedies, equipment needed for head lice treatment, and more advice and tips I learned during the process of ridding my home of head lice. Next part of series: Part 8: Home Remedies For Head Lice - What Works And What Doesn't, And What Is Safe And What Is Dangerous?